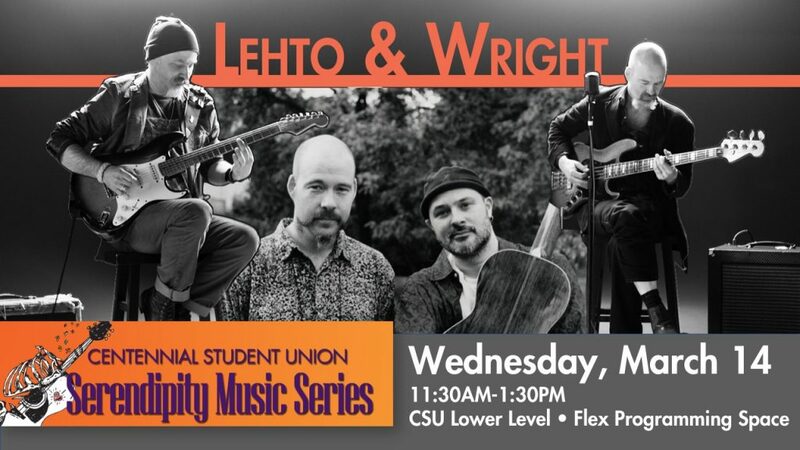 Just in time for a St. Patty’s Day primer, Minnesota guitar masters Lehto and Wright bring their traditional Celtic and American folk/rock sound to their first appearance with the Centennial Student Union Serendipity Music Series. The duo’s free two-hour daytime performance will be Wednesday, March 14, from 11:30 a.m. to 1:30 p.m. in the CSU’s Lower Level Flex Programming Space. Lehto and Wright’s accomplished twin guitar/mandolin approach features “unplugged” song sets ranging from Irish tunes to American spirituals. Their musical style, shaped by such influences as Jethro Tull, Miles Davis and King Crimson, challenges the boundaries of the traditional Folk genre. The CSU’s ongoing Serendipity Music Series is a mid-day, mid-week, “street corner serenade” series that seeks to expose students, the campus and the Mankato community to a range of genres by Minnesota musicians. Lenny Koupal, coordinator of the series, said it was “serendipity” to come upon Lehto and Wright. The Centennial Student Union invites students and alumni to join its 50th Anniversary Reunion Celebration on Homecoming Day, Saturday, Oct. 7. Highlighting CSU reunion festivities during Minnesota State University, Mankato Homecoming Day 2017 activities will be an afternoon reception starting at 3:30 p.m. in the CSU Hearth Lounge. Other days activities will be a morning light breakfast, an invitation to participate in the Homecoming Day parade, and an evening “family friendly” event. Mark Constantine, director of the Centennial Student Union, said activities celebrating the student union’s 50th anniversary will begin at the start of the Fall 2017 semester and continue through Homecoming 2017. Photos and memories can be shared on the CSU 50th Anniversary website, www.csu.mnsu/50thAnniversary. Shared memories will be displayed in a CSU Art Gallery exhibit from August through the Homecoming celebration. The CSU also is creating a 50th anniversary display that will be used in the CSU throughout the 2017-18 academic year as well as with the University’s planned Sesquicentennial traveling display. The CSU display will include a video timeline featuring CSU directors, key staff members and special guests.